Cholesterol is a waxy substance found in fat that the body relies on for hormone. However, cholesterol in your diet can increase the risk of cardiovascular problems, and the American Heart Association recommends limiting cholesterol intake to 300 mg each day -- or 200 milligrams if you already suffer from high cholesterol or heart disease. Most fast food is high in cholesterol, so it's not the best choice if your are trying to lower your cholesterol count. 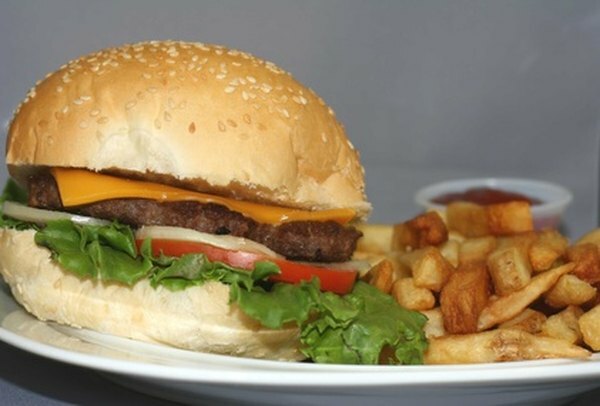 Beef-based burgers from fast food restaurants can range from about 60 to 150 milligrams of cholesterol, while chicken burgers have between 50 and 90 milligrams of cholesterol. Beef generally has more cholesterol than chicken, and the larger the burger, the more cholesterol it will have. Burgers that have cheese, heavy doses of condiments and strips of bacon will have higher cholesterol counts. Fries are low in cholesterol and, in some cases, cholesterol-free. A small order of fries from one leading fast food restaurant contains just 1 milligram of cholesterol, while a large order contains 2 milligrams. Snacks, such as chicken nuggets and wraps contain between 30 and milligrams mg of cholesterol. Onion rings are similarly low in cholesterol, containing about 1 milligram per small order. Breakfast products contain the highest cholesterol counts in the fast food industry due to their egg content. A classic egg-based breakfast sandwich contains 260 milligram of cholesterol, while larger versions can contain up to 300 to 400 milligrams. Breakfast burritos have even more, with about 465 milligram of cholesterol per serving. When the egg is removed, breakfast products contain much lower cholesterol counts, generally under 100 milligrams per serving. Ice cream products are another high source of cholesterol, with shakes containing about 75 to 130 milligrams per serving. Ice cream desserts such as sundaes and cones contain about 25 to 30 milligrams of cholesterol per serving, while cookies and cakes contain between 10 and 30 milligrams. Soft drinks and ice tea beverages are free of cholesterol. Fast food restaurant salads vary in cholesterol content depending on ingredients. Salads that don't contain meat or eggs are usually low in cholesterol or cholesterol-free. Salads containing chicken contain about 50 to 70 milligrams of cholesterol, while bacon and egg can add an additional 10 to 20 milligrams. Southwest, caesar and ranch dressings contain about 20 milligrams of cholesterol, while Italian and vinaigrette dressings are cholesterol-free.